August 27, 2013 (Tuesday, cont’d) – Our departure from dry, grain-filled eastern Washington and arrival in pine-forest covered Idaho was noticeable almost immediately. The road past Heyburn State Park (probably a fine place to camp) is scenic with lake views. We refueled in St. Maries and turned north up to Harrison, the closest town to our campsite and home to a general store, coffee shop, bike/paddle rentals etc. Less than a mile beyond, we saw a moose on a little island in the lake, and an osprey perched on a tree branch by the roadside. What a perfect welcome to summer camp on Lake Coeur d’Alene (CDA)! The access road for Bell Bay Campground in the Idaho Panhandle National Forest is three miles long and mostly unpaved, meaning it takes Sven 10-15 minutes just to get to/from Route 97. The reward is well worth it. We arrived a little after 3 pm. Our reserved site #4 was fine but on the inland side of a small loop (itself the lower loop of the campground), and the manager let us switch to the much more desirable site #8 as the campground is half-empty. Site #8 sits directly above Lake CDA facing south/west with gorgeous views and sunsets. It is not so private with the neighboring site occupied (though that only lasted one of our two nights), but this campground is more remote and scenic than our prior stops. My only serious gripe is the incessant buzzing of bees, though thankfully this subsides in the evening. We set up and walked down a short path to the swimming dock for a little exercise and a dip in the cool but refreshing lake. There was no one else around, and a little rest in the afternoon sun on the dock may have been the most relaxing hour of the trip thus far. As I write leaning back in my boat chair overlooking a lake surrounded by pine-covered hills at sunset in perfect weather, I could not be more content. Each time we camp it is amusing how minimalist is our set-up compared to all others. Almost everyone else at least has an SUV and brings a large family size car camping tent, a proper stove, tablecloth, lantern, big chairs, etc., and a high percentage have full campers/trailers. August 28, 2013 (Wednesday) – The morning was drier and warmer than our prior camping nights. After some oatmeal, tea and coffee, we departed for Coeur d’Alene. While not so far as the crow flies, it takes a solid hour due to the unpaved campground access road and hilly and windy Route 97. We were in search of a coffee shop for what we thought might be a few hours of work. Java was packed, so we opted for Calypso’s. It is spacious and comfortable and serves reasonably good salads and sandwiches, which is nice because we were there from 11 am til 6 pm! At least we got to walk through the farmers market that runs Wednesdays from 4-7 pm on 5th Street between Sherman and Coeur d’Alene Avenues. Thankfully we found some potatoes (Idaho’s most famed export) to wrap in foil on the grill with more chicken thighs, but the market was not particularly impressive. There was live music there and a much larger production around the corner at 6th and Sherman. On the drive home, we saw deer in several places, including one for which I had to brake intensely. Route 97 hugs the lake at enough elevation to afford constant views. It is friendly to convertibles, and the blue skies and temperature in the 70s made for a pleasant joy ride. We made a campfire, cooked dinner (perhaps psychosomatic but the spuds were scrumptious), and thoroughly enjoyed our bottle of 2012 K Viognier from Charles Smith. Critical surgery, or just eating Idaho spuds? Although we saw relatively little and did even less in our brief time here, I can offer a few ideas to help orient you. The town of Coeur d’Alene sits on the north side of Lake CDA and is fairly substantial with a population around 45,000. Sherman Avenue between 1st Street and 7th Street seems to be the main thoroughfare, with activity on Lakeside Avenue as well. There is a little waterfront park in town, and Tubbs Hill is a forested peninsula extending into the lake with some walking trails. Lake CDA is a popular cycling area. The Trail of the Coeur d’Alenes runs more than 70 miles between Mullan and Plummer, and we were quite bummed to miss the Route of the Hiawatha Rail-Trail. There are shops in CDA renting bicycles, kayaks, paddle boards etc. We also heard that boating and fishing through the Chain Lakes makes for a nice day. Of course there is much more to do in Idaho. In the southern part of the state, Sun Valley is a legendary year-round resort and stomping ground of the rich and famous. I would love to visit someday, but it was serendipitous we skipped it this time as we missed horrific wildfires. About an hour and a half north of CDA, Schweitzer Mountain was voted by Ski Magazine the best kept secret in North America. 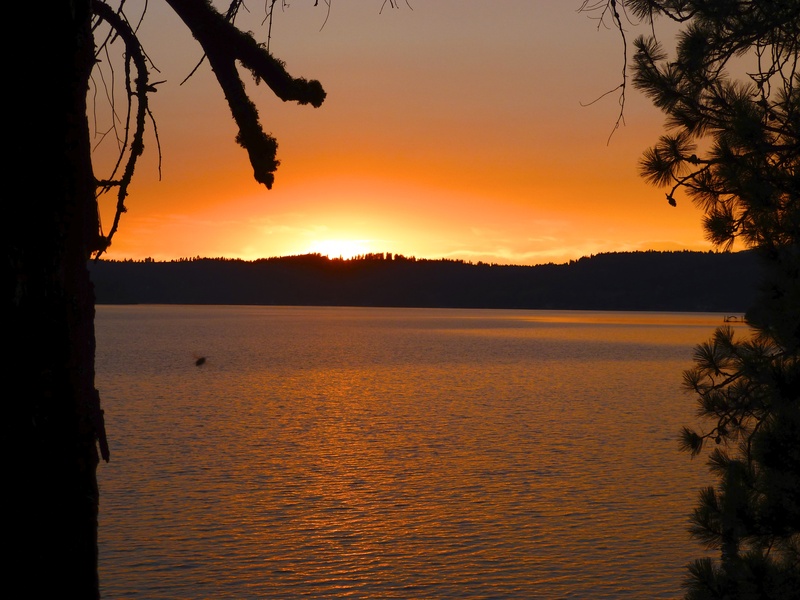 This entry was posted in Idaho, North America, Uncategorized and tagged Bell Bay Campground, Coeur d'Alene, Idaho on September 14, 2013 by aleavitt77.